This latest design indicator has many in-built functions to suit most weighing applications, including: Counting, Hold & Peak Hold, lb/kg switching, Live Weigh & High/Low Level Control. 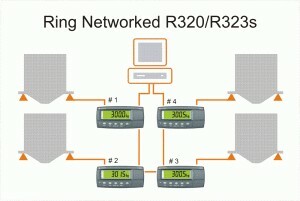 The R320 utilises the powerful Sigma~Delta A/D, a 4 layer surface mount PCB and has a RS232 output for printing, remote displays or for basic network polling. There are two Isolated Low Side Driver Outputs available for set points or high/Low level control. The 20mm LCD display has LED back light for easy viewing in all lighting conditions. All cable connections are via spring-locking terminals for ease of installation (no soldering required). There is a Rin-LINK infra-red port designed into the display for PC access to all setup and calibration functions. The “FLASH” ROM allows for quick and easy updating of standard or custom software in the field. The R300 series of indicators builds on over 15 years of design experience to create aseries of cost effective reliable products that are ideal for use in mobile applications suchas forklifts, platforms, inside truck cabs, crane scales and OEM applications. The compact housing and versatile power supply options make them suitable for basic weighing through to OEM applications. They are ideal for basic weight-control or level-control functions. R323 IP65 stainless steel housing. Each comes in a panel mount variant, with options for desk, wall and pole mounting. Built in RS232 communications port is 15kV static protected. Wide DC operation (7-24V) to suit a variety of onboard OEM applications. Eliminates theneed for third party power supplies saving on system complexity and cost. Long life rechargeable battery options ideal for mobile installations allowing for operator flexibility. Opto-link magnetically coupled link on front fascia for easy access in sit for updates/setup of the indicator, saving the installer time and effort. IP65 rated housings: Dust and water tight, increasing reliability and indicator life time. Trade approved in Australia, Europe and USA. Products are export ready with approved component.